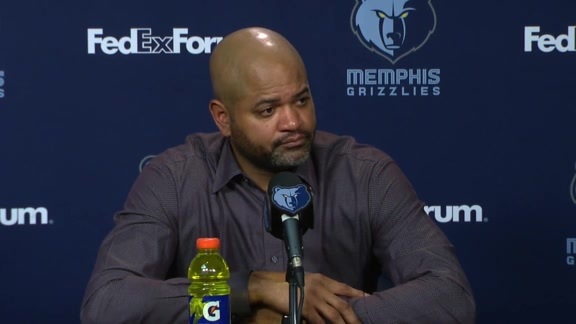 Grizzlies Head Coach J.B. Bickerstaff speaks with the media following the Grizzlies 126-125 win over the Rockets on Wednesday night at FedExForum. 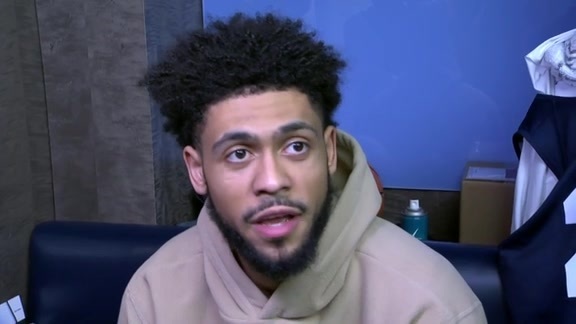 Watch Tyler Dorsey’s speech following the Grizzlies win over the Rockets. 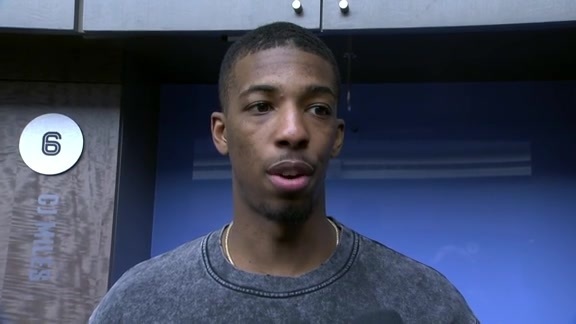 Hear from Delon Wright as he speaks with the media after Wednesday’s victory over the Rockets. 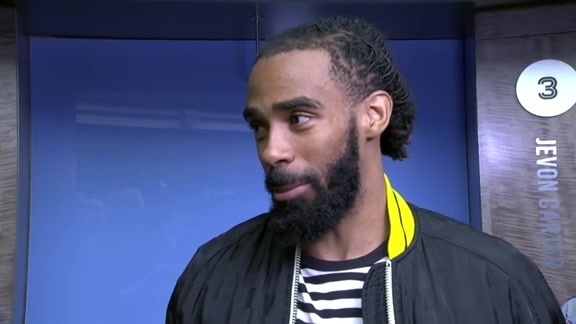 Hear what Grizzlies guard Mike Conley had to say to reporters following Wednesday’s victory over the Rockets. Watch the key moments of Wednesday night’s game at FedExForum. Find out what Jonas Valanciunas had to say after the Grizzlies win against the Rockets. Mike Conley scores a team-high 35 points Wednesday night against the Rockets. Jonas Valanciunas scores 33 points in a win over the Rockets. Mike Conley hits from downtown during the team’s matchup against the Rockets. Joakim Noah spins away from coverage and gets the bank shot. Jonas Valanciunas and Justin Holiday connect for the slam dunk. 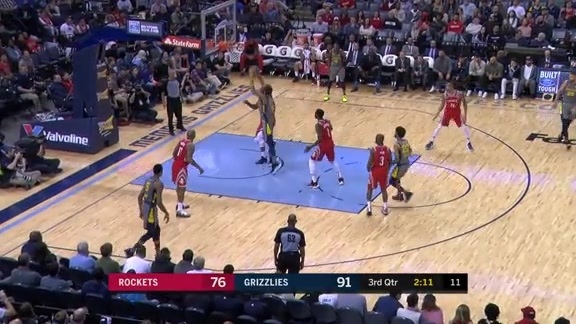 Chandler Parsons fires a deep three from beyond downtown. 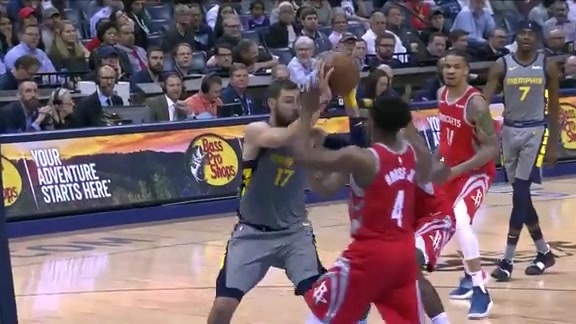 Check out Jonas Valanciunas’ nice fadeaway over the Rockets. 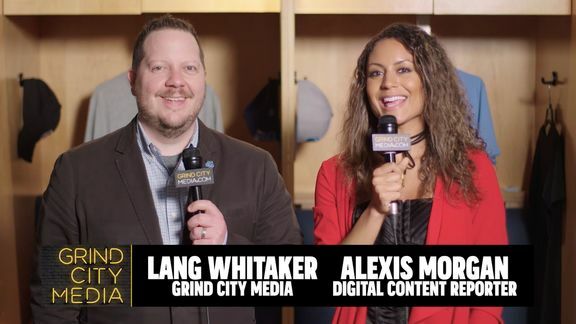 Grind City Media’s Michael Wallace previews tonight’s game against the Rockets at FedExForum. The Grizzlies won on the interior, outrebounding the Rockets 50-39 (+11) and outscoring them 54-36 in the paint. Memphis made 27-of-46 (.586) shots in the lane while Houston finished 18-of-37 (.486). 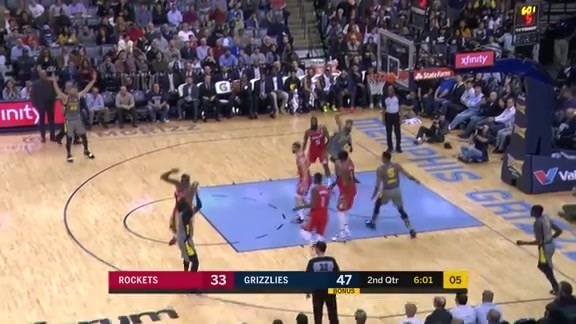 After a James Harden layup made a layup at the 3:24 mark of overtime to give Houston its first lead of the game, Memphis took the lead back with a long 7-0 run over the next 2:27. While Harden would tie the game up one more time with 15 seconds left, the Grizzlies never trailed again. Jonas Valanciunas set his career high in scoring with a game-winning free throw with 0.1 seconds left to help the Memphis Grizzlies stave off the Houston Rockets, 126-125, in overtime on Wednesday night at FedExForum. The Grizzlies improved to 29-42 on the season and 19-17 at home. The Rockets dropped to 45-27 on the year and are now 19-17 on the road. Valanciunas finished with a career-best 33 points to go with a season-high 15 rebounds for his 11th double-double of the season. Mike Conley led Memphis with 35 points and a team-high eight assists, tying a career high with his sixth straight game with at least 20 points. Valanciunas is averaging 19.1 points and 8.3 boards in 13 games with Memphis, while Conley moved within 30 points of surpassing Marc Gasol to reclaim the top spot on the Grizzlies’ all-time scoring leaderboard. James Harden totaled 57 points and handed out a team-high eight assists for Houston. Harden averaged 47.3 points per game in four contests against the Grizzlies, helping the Rockets win the season series (3-1) for the first time since the 2009-10 season. In overtime, Harden made a running layup at the 3:24 mark, giving the Rockets their first lead of the game. 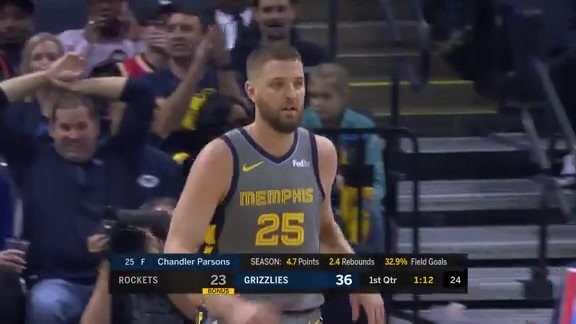 Memphis proceeded to take back the lead with a 7-0 run over the next 2:27 (3:10 to :43), highlighted by a Chandler Parsons three on the wing with 54 seconds left in the extra period, to go back on top 123-117. Harden wouldn’t let Houston go away, as he drilled a 27-footer, stole the ball, and made an open layup in a span of 10 seconds to tie things up at 125 apiece with 15 seconds left. 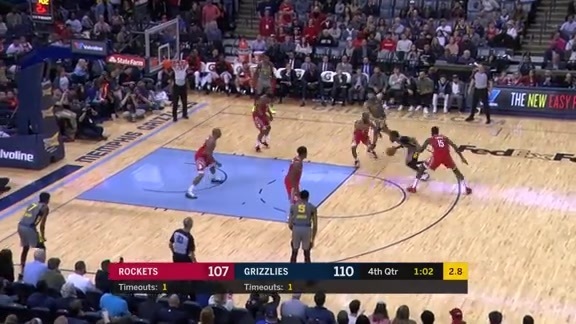 With Memphis holding on for one shot, Conley dribbled the clock down until four seconds remained, cut into the lane and missed a floater. However, Valanciunas was fouled on his rebound attempt with just 0.1 left, sending him to the line. Valanciunas canned the first and then intentionally missed the second to force contact with the ball, running the clock out to end the game. Harden scored all 10 of Houston’s points in overtime, but the Grizzlies turned three offensive rebounds into a 3-0 advantage in second chance points to protect the victory. Bruno Caboclo added 15 points and seven rebounds for the Grizzlies, who were without five rotation players due to injury. Caboclo has now scored in double-digits four times this season. Parsons came off the bench to add 11 points, six rebounds and three steals. Parsons is averaging 13.5 points, 6.0 rebounds, 3.5 assists and 2.0 steals as a reserve in his last two games. Memphis finished the game shooting 41-for-89 (.461) from the field and 13-for-37 (.351) from three-point range. Houston was slightly worse overall, going 42-for-94 (.447) in the game, but made 21-of-48 (.438) threes, the most three-pointers made by a Grizzlies opponent this season. The Grizzlies won inside, outrebounding the Rockets 50-39 and outscoring them 54-36 in the paint. 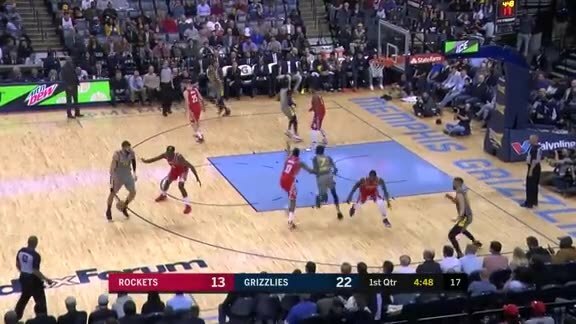 Houston’s defense, which entered the night ranked fifth in the NBA in steals (8.6 spg), forced Memphis into 17 turnovers while committing 14 of their own, and outscored the Grizzlies 23-17 in points off the giveaways. The Rockets were a perfect 20-for-20 at the free throw line while the Grizzlies finished 31-for-39 (.795). Chris Paul flirted with a triple-double, scoring 18 points while logging seven boards and seven assists for Houston. Paul scored 16 of his 18 points during the second half. Clint Capela recorded his 38th double-double of the year by finishing with 14 points and 10 boards. Capela is currently 11th in the NBA in double-doubles. 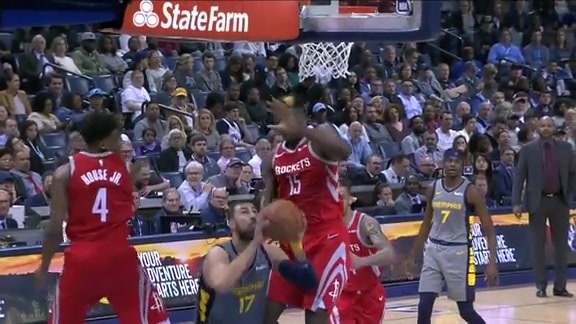 The Rockets surged back into the game late in the fourth quarter, going on a 17-2 run from 6:40 to 2:29 (4:11 run) to trim the Grizzlies lead to 106-104. With 1:24 left, Paul buried a corner three to make it 110-107. Conley would respond with a floater at the 1:00 mark, but P.J. Tucker connected on a corner three of his own to make it 112-110. Houston was forced to foul Caboclo, who made 1-of-2 with 20 seconds left, but Capela knocked down a pair with :07 left, cutting the Memphis lead to 113-112. After a Grizzlies timeout, the Rockets fouled Justin Holiday with five seconds remaining, who entered the night shooting 89.2 percent at the charity stripe. Holiday nailed both to go up 115-112, but then fouled Harden on a three-point attempt with four ticks left. Harden drained all three free throws, sending the game to overtime. Harden caught fire in the fourth quarter, scoring 18 points (4-5 3P) to carry Houston. The Grizzlies missed all eight three-pointers in the fourth quarter, while the Rockets went 9-for-16 (.563). The Grizzlies defense ramped up the intensity after halftime, scoring 11 points off of seven Rockets turnovers in the third quarter. The Grizzlies went on an 8-0 run midway through the third from 5:41 to 4:28 (1:13 span) to extend their lead to 89-72. Memphis outscored Houston 18-6 in the paint - and made all seven free throws - to take a 97-78 lead into the final frame, their largest lead of the night. Memphis made over half their shots in the first half, shooting 19-for-36 (.528) from the field and 8-for-19 (.421) from three-point range. Houston went 18-for-44 (.409) in the half and 7-for-20 (.350) from long distance. The Grizzlies owned the boards, outrebounding the Rockets 24-15 in the half and outscoring them 11-7 on points in the paint. Harden had 25 points for Houston at the break, while Conley dropped 21 for Memphis. Memphis didn’t miss much in the opening quarter, thanks in large part to Conley (4-4 3P) and Valanciunas (4-4 FG), who scored a combined 26 points in the period. The Grizzlies overall went 14-for-19 (7-12 3P) from the floor, their best first-quarter shooting performance so far this season, while the Rockets shot 9-for-22 (4-9 3P). 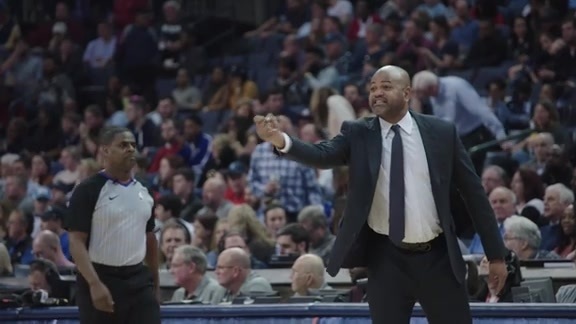 The Grizzlies closed the quarter with a 9-2 run over the last 3:11, which included Parsons swishing a 31-foot heave as the shot clock expired at the 1:17 mark, and Conley hitting a floater in the lane with 0.5 seconds left, to give the Grizzlies a 38-25 lead after one. This marked the first time since the 2012-13 season that the teams did not split the season series (Grizzlies won 3-1). The Grizzlies will look to sweep the season series over the Orlando Magic on Friday, March 22 at 6 p.m. CT in the Amway Center. Tune in to FOX Sports Southeast presented by Pinnacle Financial Partners or listen on 92.9 FM ESPN to follow the action. He’s a load down there, obviously. He’s able to get to his spot and he’s big enough where when he catches it at his spot, it doesn’t take him a whole lot to get to his shot. It’s one bounce, and he uses his size and he can release it over the top. They started to bring double teams and he was aware and able to find some cutters out of it. We talked to him about it. I felt like there were more opportunities for him to score. He started to look for the double team instead of being aggressive and forcing the double team in the second half a little bit, but his size and his touch make it difficult. And then, where he did a great job was on the glass after the fact. He might not have gotten the ball, but they go up for a shot and he uses his size and his power to come up with some offensive rebounds, like the big one he had down the stretch. We hope so. It’s been a while, obviously, since he’s played this many games in a row. So, that’s a start for us. Now he catches his rhythm and his legs are getting underneath him. He always uses his smarts and knows how to get to his spots and is a good playmaker, but I think the shots going in make a big difference for his game and they open up the floor for him to attack and make plays for other people. Injuries, obviously, took a part in that. But, it just felt like the group of guys that were on the floor had a rhythm going and they were playing well with one another. We just wanted to sprinkle those eight guys throughout the rotation tonight because they had it going a little bit. They slipped a screen. We were supposed to stay with their own man. We slipped a screen and ended up a little bit behind them. The pump-fake happens and with the threat that he is, we took the bait on the pump-fake. From where we stood, it looked like he went past him. From the referee’s angle, it looked like he hit him, I guess, so he made the call there. But, we made a mistake on communication on that initial slip and we lost his body early, which put us in a position where we were trying to chase him down, and then we were late and a little overzealous. The guy is capable, obviously, of making all of those plays. We’ve seen it time and time again throughout this season and through his career. But, you have to have a little bit of fortitude down the stretch. You have to be strong in your belief, and feel as if you can win and you can make the next play. And, I thought our guys continued to do that. The best part about it is that it was a bunch of different guys. It wasn’t just one guy who was making the play. It was a bunch of different guys down the stretch who impacted the game. He didn’t want that momentum to shift in their favor. Down the stretch, they obviously made some huge plays, but it was a 0-0 game. It was a five-minute game that we had to go out and find a way to win and not let what happened in that fourth quarter impact us. So, he was just rallying the guys to get them to go out and do that. It’s who he is. When he first showed up, that’s who he’s been. He’s obviously learning the terminology and things that we’re trying to develop, but from a personality standpoint, he’s been all in. That’s been refreshing, honestly, that all of these guys, no matter the circumstances that they came from, they were all about trying to help this team. With his personality, he wants the right things. He tries to do the right things all the time. So, guys believe it when he says the things that he says and they feel his energy and his purpose. He has to be who he is. He has the ability to make shots and play-make with the ball. In this league, there’s no greater threat than a guy who can put the ball in the basket from range, and he has the ability to do that. He is a steady defender and he’s in the right place most of the time. He understands the personnel and the guy he’s guarding, but I think his biggest influence on the game can be on the offensive end where he has ability to get it going. It got crazy there for a little bit, that was a fun game. 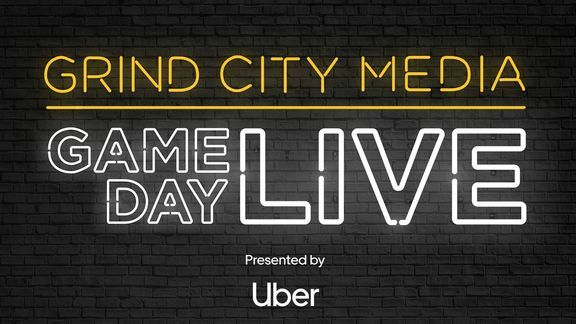 It’s the kind of game that you want to be part of – big plays, big opportunities for everybody. The way it ended was wild. 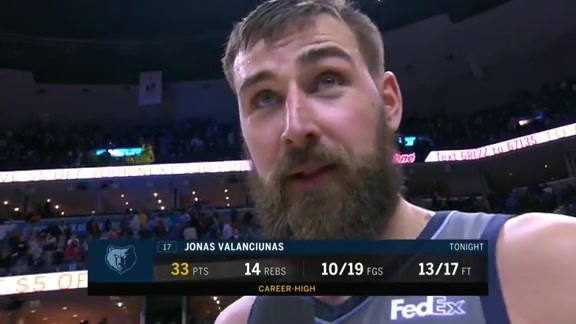 I think JV [Jonas Valanciunas] doing JV things – being a house down low and saving the day was huge, big night for him. I’m just happy we got away with a win. Live, I thought he might have gotten him a little bit. I saw it on video and I thought he kind of missed him. It’s just a tough play. We can’t put ourselves in that situation to even have the option of a foul or not. [James] Harden is Harden for a reason. All three of those free throws were big. We have spoken about trying to stick with our matchup while the ball was still out of bounds. Once it got in, we were going to switch everything. They set a good screen and dislodged Justin [Holiday] a little bit and he wasn’t able to stay attached. In that time, we probably should’ve just emergency switched and not allowed him to get any good look at the rim and not be behind, but it happened so quick that it was just a tough one. When you’re playing against a guy like that and seeing the shots he makes, plays he makes, you want to take that challenge. I think all of just accepted it. He’s a great player. You know it’s going to be a dog fight. You have to expect he’s going to make every shot down the stretch. What are we going to do when we go down to our end? I think everybody just stood up and really made that challenge known, accepted it and did what we had to do to win. JV [Jonas Valanciunas] is who he is. He gets the ball in the post and he goes straight to the basket, straight to work – that really helped us out a lot. They really thrive on switching and trying to create mismatches, stop the ball movement. We had JV doing stuff he was doing on the post, they had to start double teaming. They had to start bringing extra bodies and it really opened up the game for us a lot. 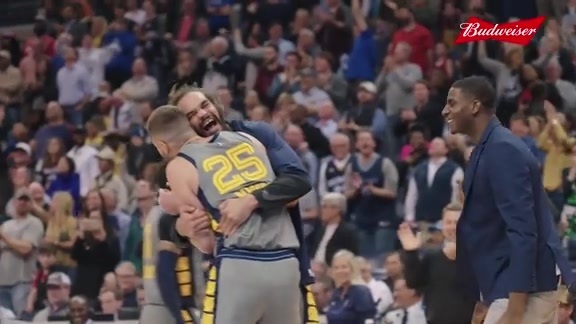 It was just a big time game for him, big time effort, and Joe [Joakim Noah]. All the bigs did a good job of just being physical presences down low. We had just done almost the same exact play a couple plays before. He didn’t move on that one. I thought he was going to stay in the same spot in the second one and he slid. I never looked at him. It was kind of one of those things where I know he’s there and I see his man come over and I throw a no-look to him. When I saw he moved, I thought ‘Oh shoot, I threw it out of bounds.’ He made a great catch and man he’s been playing great. I’m just happy to see him doing what he loves to do and just trying to silence the people that have been negative on him and just being a pro while he’s doing it. It’s not like we’re like, ‘Oh, they’re a playoff team we want to play better.’ We’re trying to win every game. It just so happens that we’re beating the playoff teams that are playing for something. Mike Conley led Memphis with 35 points and a team-high eight assists. Conley has now scored at least 20 points six-straight games, and is now 30 points away from surpassing Marc Gasol as the franchise’s all-time leading scorer. Jonas Valanciunas scored a career-high 33 points while pulling down a season-high 14 rebounds, giving him his 11th double-double of the season. Valanciunas is averaging 19.1 points and 8.3 boards in 13 games with Memphis. Bruno Caboclo added 15 points and seven rebounds. Caboclo has now scored in double-digits four times this season. Chandler Parsons came off the bench to add 11 points, six rebounds and three steals. Parsons is averaging 13.5 points, 6.0 rebounds, 3.5 assists and 2.0 steals as a reserve in his last two games.